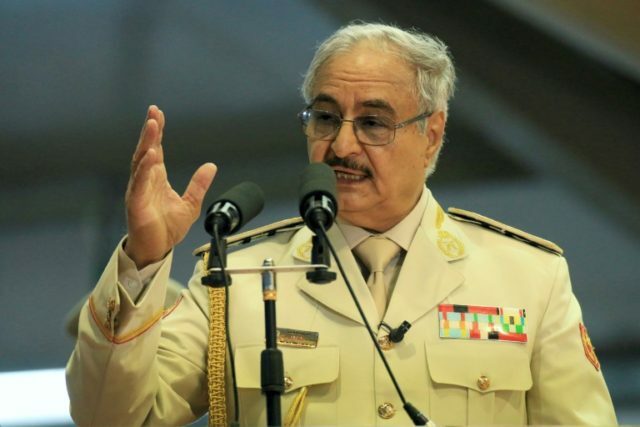 Jihadists loyal to the Islamic State reportedly attacked a stronghold Tuesday under the control of Libyan warlord Khalifa Haftar (pictured) miles from Libya’s capital, Tripoli, where Haftar launched an invasion to overthrow the internationally-recognized government this week. Haftar, who was said to control up to two-thirds of the country as recently as last month and has identified himself as an anti-Islamist military leader, has sought to rule Libya for years and attempted an invasion of Tripoli in 2014. His troops, the Libyan National Army (LNA), have played a role in tempering the influence of groups like the Islamic State and al-Qaeda, though some have accused him of forming alliances with jihadists on the ground in his pursuit of control of Tripoli. Haftar’s troops attacked Tripoli’s Mitiga Airport, the only functioning airport in the country, on Monday, forcing the internationally recognized Government of National Accord (GNA) to shut it down and attracting global condemnation. While Haftar turned his eyes to Tripoli, Islamic State supporters took the opportunity to attack the LNA in southern Fuqaha. According to Reuters, which cited “residents,” “a group loyal to the jihadist Islamic State (IS) attacked the town of Fuqaha, killing three people and kidnapping another before leaving.” The report did not offer any more details, other than to note that Haftar’s troops appear to comfortably control Fuqada. Its distance from Tripoli suggests that the jihadists struck in the hopes that the LNA would be too distracted to successfully retaliate. No other reports of Islamic State attacks have arisen since the Tripoli attack anywhere in the country. The Islamic State has long expressed an interest in taking over Libya given the lack of a coherent government structure there, however, and both GNA officials and terrorism experts have warned for months that instability in the country could create a fertile ground for the group to establish a stronghold there. The Islamic State successfully did so in the coastal city of Sirte for a year in 2016 before a U.S.-backed coalition attacked and defeated the group there, once considered its largest stronghold outside of Syria and Iraq. The Islamic State also had a significant presence in Benghazi before Haftar’s troops eradicated it from there. Shortly after the liberation of Sirte, experts warned that the Islamic State survivors of that battle would try to regroup and take over more of the country. “Having been chased out of the capital Sirte last year, ISIS is now believed to be recruiting jihadis from rural southern regions and the western town of Sabratha, just 60 miles from the Tunisian border,” the Daily Mail reported at the time. Similarly, last year, experts repeatedly suggested that Libya could provide a new home for Islamic State jihadists fleeing battlefield defeats in Syria and Iraq. U.S. Africa Command (AFRICOM) spokeswoman Robyn Mack warned at the time that the Islamic State would seek “targets in the Libyan oil crescent” to establish itself and “to launch strikes” from those locations. “Libya has become a safe haven for leaders of ISIS fleeing ineluctable defeat by American forces in Iraq and Syria. What is coming is unimaginably worse than Gadhafi. The decline of Libya, the 16th largest country on the planet, worries the Pentagon,” Kryza wrote. Those warnings continued into the present. As recently as this March, Libyan Interior Minister Fathi Bashagha told Bloomberg that the United States should support the GNA in establishing itself concretely, as the struggle between the GNA and Haftar, complicated by the presence of dozens of regional and tribal militias, made Libya an attractive place for terrorist activity. Prior to the attack on Tuesday, the Islamic State most recently claimed a gun attack and suicide bombing in Tripoli targeting the GNA’s Foreign Ministry. Officials insisted that no evidence suggested a direct tie to the Islamic State, but the group’s Amaq news agency praised the jihadists responsible as “soldiers of the caliphate.” The attack killed three and injured 21. GNA officials appear primarily focused on the threat posed by Khalifa Haftar currently, as his attack on Tripoli has left all of Libya without an airport. While no reports of deaths in the airport strike have surfaced, the GNA claims that at least 25 people, including civilians, have died as a result of the Haftar invasion, and 80 have been wounded. Haftar’s troops claim 19 deaths among their ranks. The United Nations has released its own tally, reporting that 47 have died and 181 have been wounded as part of the attack. The World Health Organization (WHO) also reports the deaths of two doctors in the assault.